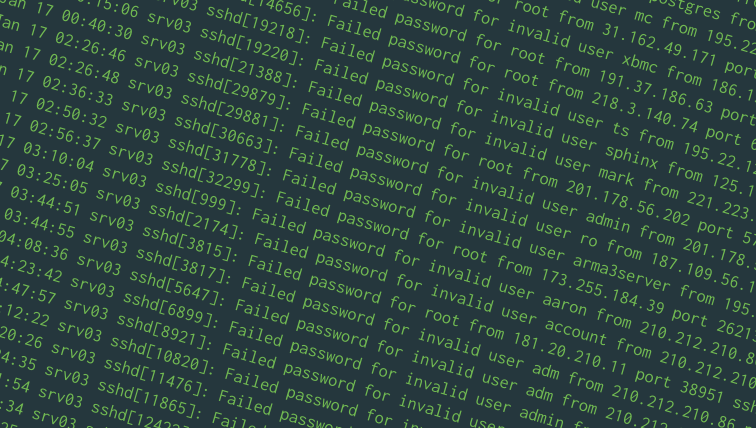 A good way to protect SSH would be to ban an IP address from logging in if there are too many failed login attempts. You can use a package called “fail2ban” for this purpose, and it works with minimal configuration. In addition, you can even configure Fail2ban to protect other applications, like web servers. We’ll cover how to protect SSH with Fail2ban in this post. These instructions should work on modern versions of Ubuntu (16.04 and later), Debian and CentOS 7. On CentOS, you should first enable the EPEL repository and install Fail2ban. That’s it! With this minimal configuration, Fail2ban will block an IP for 10 minutes if it notices five failed logins occurring in a 10-minute period. Filters specify certain patterns of text that Fail2ban should recognize in log files. Actions are things Fail2ban can do. Jails tell Fail2ban to match a filter on some logs. When the number of matches goes beyond a certain limit specified in the jail, Fail2ban takes an action specified in the jail. Fail2ban comes with a jail instructing it to look at system logs and take actions against attacks on SSH. The default action (which is discussed later in detail) adds iptables rules to block out attackers. In the previous section, we set the “enabled” setting of the “sshd” jail to true, so that Fail2ban can block these attacks. In the next section, we will see how you can configure some aspects of Fail2ban. While the defaults will suffice for most, sometimes you may need to change things so that it suits your needs better. maxretry controls the maximum number of allowed retries. bantime specifies the time window (in seconds) for which the IP address will be banned (86400 seconds is 24 hours). If you have moved SSH to a different port, you can also specify the port number with port = <port_number> in this file. As their names suggest, the actionstart and actionstop lets you specify initialization commands that will be run when Fail2ban starts up and shuts down. actionban and actionunban specify the commands which will be run when Fail2ban wants to block an IP. In addition, Fail2ban may also need to verify whether an IP is already blocked, and the command specified in actioncheck helps it to do so. To see a practical example of this, have a look at the /etc/fail2ban/action.d/iptables-multiport.conf file. When specifying these commands, you can use the <ip> placeholder to get the IP address of the attacker. As a server administrator, you may have noticed that there are some IPs that keep brute forcing over and over, despite the bans. You could work around this by setting a low value of maxretry and findtime and a high value of bantime, but this risks locking out legitimate users. Fortunately, you can block these attacks by setting up multiple jails. For our example, we’re going to define a jail named sshlongterm. It will block an IP for a week if there are 35 failed attempts login attempts over 3 days. These settings allow up to 35 failed logins over 3 days before blocking the IP for a week. Restart fail2ban for these changes to take effect. The default jail as well as the sshlongterm jail should now work in conjunction. Short term attacks will be handled by the default jail, and the long term attacks handled by our own jail. As we’ve seen, Fail2ban protects SSH right away. With a little bit of configuration, it can make massive brute force attacks a trivial problem.